It's cold out and Ferrel cats need your help to survive the record low temperatures recorded across North American this winter! You can help these animals by building a cat shelter using materials you already have at your house. 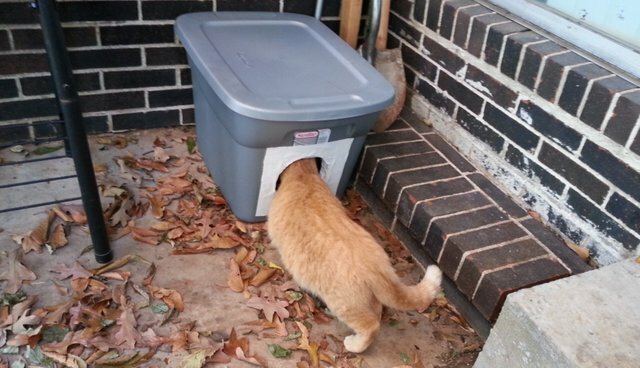 All you need is a Styrofoam cooler or an empty rubber Tupperware bin, a sharp knife, masking tape, and straw.. Cut a whole on one side of the container low enough and wide enough to allow the cats to pass through easily. If the sides around the hole are jagged, cover the corners using a few layers of duck tape. Stuff the container with stray and viola- you've got yourself a safe, warm, comfortable shelter for the stray kitties you love.